1. Mix the lemon juice, ginger garlic paste and salt in a bowl. 2. Rub this mixture on the prawns and keep aside to marinate for 30 to 45 minutes. 3. Drain any excess water and add all the other ingredients. 4. Mix well and skewer the mixture and shape into a kebab. 5. Roast in an oven/grill for 5 minutes. 6. Remove after 4 minutes and baste with oil. 7. Roast again for 1 to 2 minutes. 8. Remove the kebabs from the skewers. 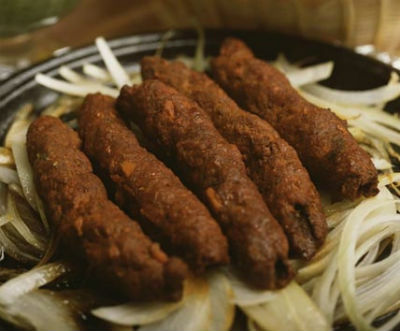 Feel free to comment or share your thoughts on this Prawn Seekh Kebab Recipe from Awesome Cuisine.